In the Photos app, select one or more of your photos. To select a photo, tap or click it. You can tell when a photo is selected because a checkmark appears in its upper-right corner. Click or tap the Share button to display the Share panel. The Mail app icon and the number of selected photos appear in the Share panel. On the Share panel, select the Mail tile. The Mail panel slides in from the right. 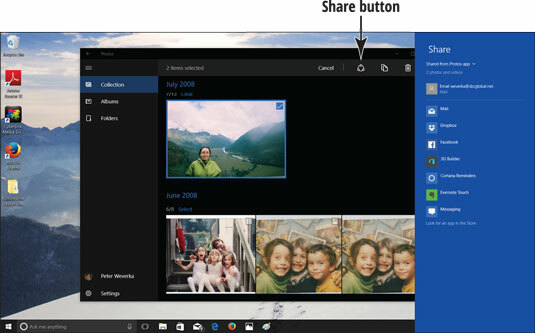 You can share using any apps that appear in the Share panel. Enter an email address under To. Add a subject. Thumbnail images of the photos you want to share appear in the content area. You can add a message below the photo. When you’re ready, select the Send button in the upper-right corner.